Masters of weaponry and combat, the Spartan warriors were skilled in arms, and carried a select choice of weapons with them to ensure they were fit for combat at any range. In many ways the Spartan’s choice of weaponry was frugal yet calculated, allowing them to adapt to various combat situations in the blink of an eye. While not traditionally a weapon the Spartan warriors sheild, known as an Apsis will feature here, mainly due to the way in which the ancient Spartan warriors would use it. The Apsis could be used defensively or pro actively as a weapon against their opponent. Trained from a young age to handle weapons, and with a fearsome reputation in the eyes of their foes, a fully matured Spartan was a dangerous enemy for any fighter. The Spartan warriors were truly skilled and adept and considered some of the greatest weapon handlers of the Greek empire. A short short, the Xiphos was the close quarter weapon used by the Spartan Warriors and typically their second choice weapon, should they be forced to use it. 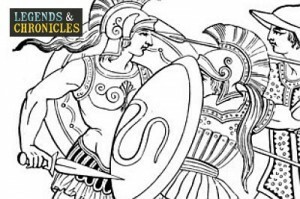 Traditionally much shorter than a Greek Xiphos the Spartan’s short sword would prove advantageous when in close quarter battle, with easier manoeuvrability, being able to inflict damage where a longer sword would be much harder to wield. The Xiphos sported a leaf shaped straight blade, and would traditionally have been made from bronze or iron, due to the leaf shape nature not requiring the strength that comes from stronger metals like steel. The Kopis was an alternative sword used sometimes by the Spartans. The Kopis was a longer curved blade that used to cut and thrust when attacking the opponent, and featured a single edge as opposed to the duel edge of the Xiphos. 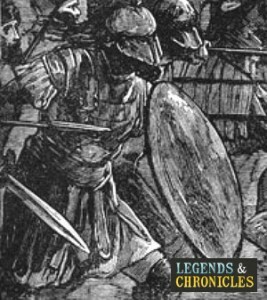 The Spartans would wield the Kopis one handed, and even though it was widely considered to be a suitable blade for use when on horseback, the Spartans with their battle skills would have used it effectively from the ground too. Another weapon the Spartans would make use of was the Javelin. Used from long range the Javelin is a throwing weapon the Spartans would employ before closing the distance on their foes. Common in the Ancient Greece, the Javelin was quite a short throwing weapon, typically three feet long, and constructed from a wooden handle combined with a bronze tip used to pierce and damage the recipient. The Dory was a spear weapon used by the Spartans, the Dory was truly a hefty spear and could be up to 9ft long in length. When used by the Spartans this spear would be weiled with only one hand, allowing the Spartan to maintain and protect himself with his Apsis shield. When wielding the Dory to attack the Spartan would mix both upwards and downward strikes at their opponents, with both underarm and overarm use of the Dory producing slightly different results. The Apsis was the shield of the Spartan warriors and much loved. Although one may consider the Apsis a defence weapon, in the hands of the skilled Spartans it could also be an attacking weapon. The Apsis is a multi material construction, and completely round in shape. The shield would start as multiple layers of wood, with a layer of leather before the outer bronze exterior. The construction of the Apsis allowed the Spartan warrior to withstand most weapons glance, and if needed was a suitably heavy blunt force weapon.